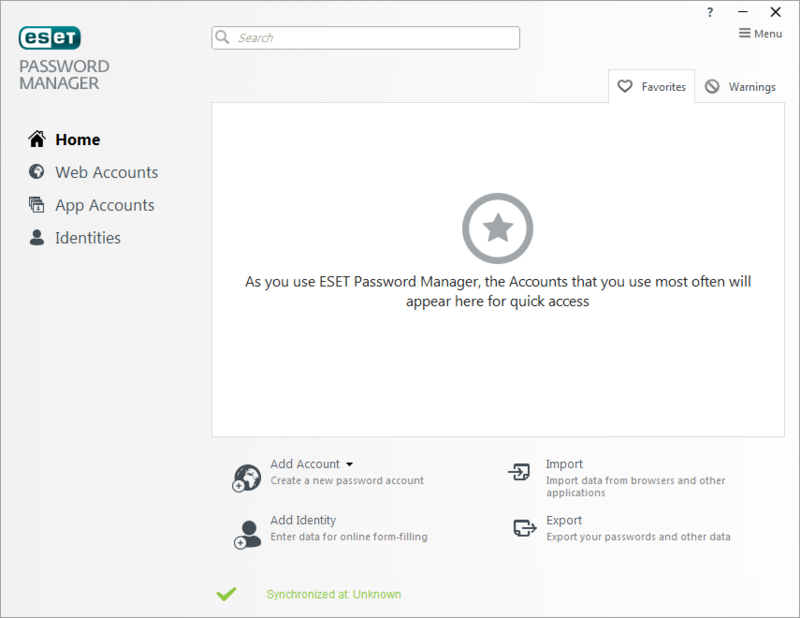 Our premium product lets you shop and bank safely, manage passwords and encrypt personal data like photos and account numbers. 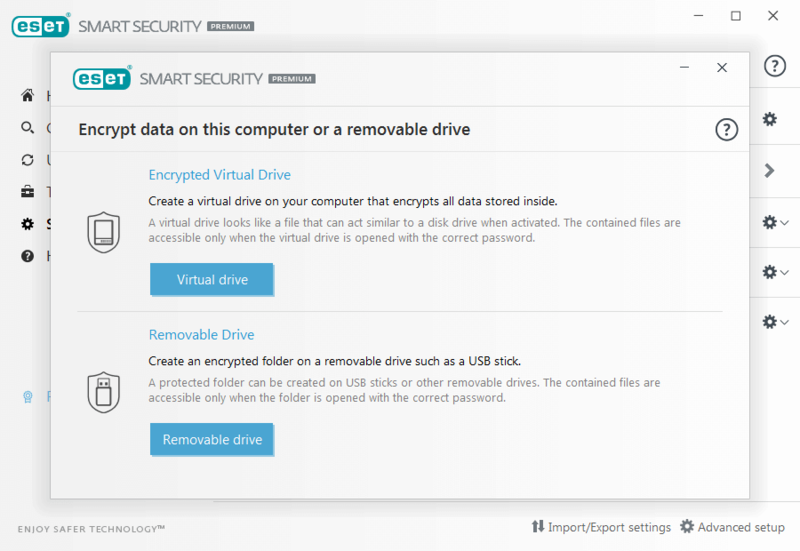 Encrypt your files and removable media for ultra-secure safeguarding of your data, and protect yourself in case of data theft or laptop loss. Full feature trial. No credit card, no commitment. 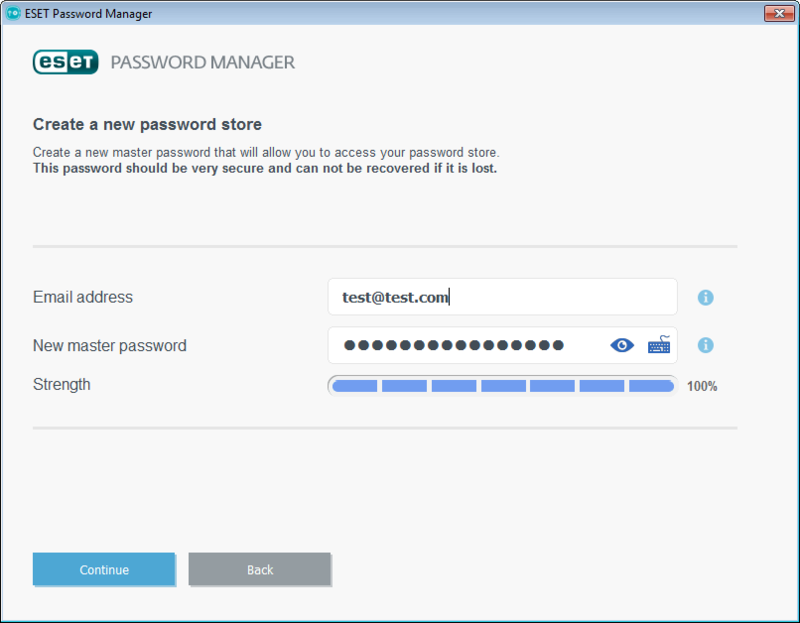 Protect your Windows, Mac and Android devices with a single license for the ultimate in security and convenience. 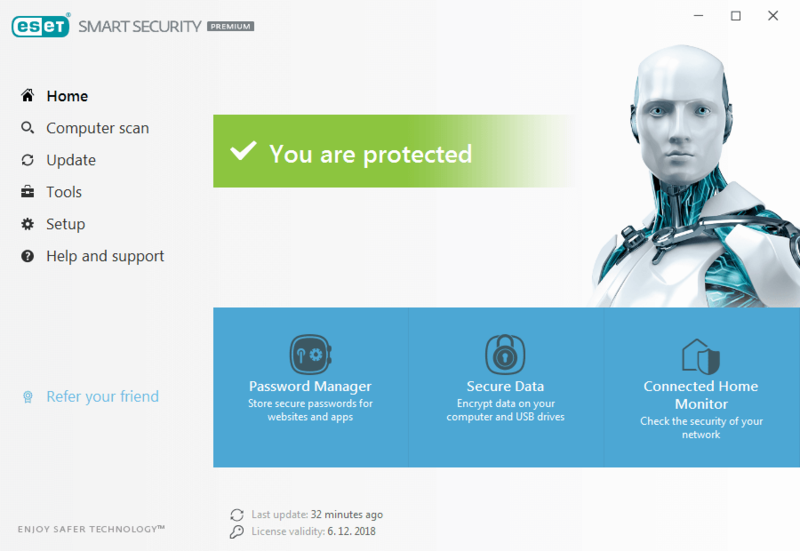 Protect your digital identity with our powerful antivirus technology. Keep your confidential data safe from ransomware and phishing. 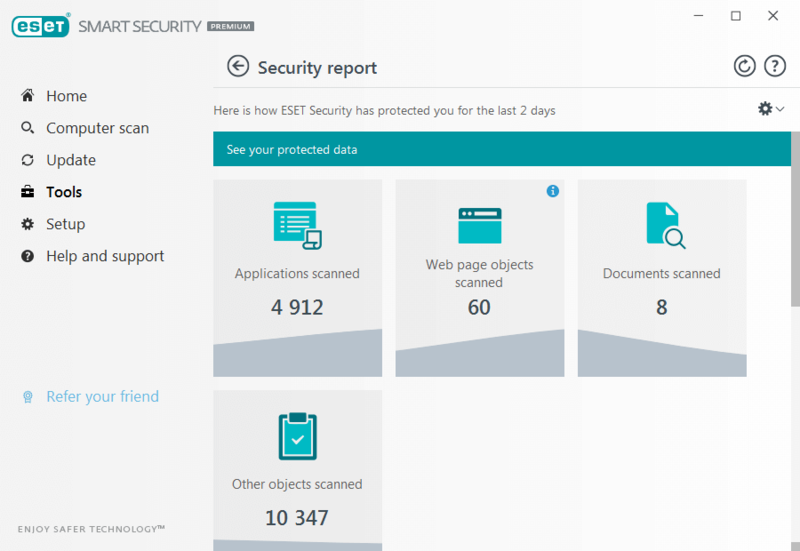 Protect yourself from ransomware and other types of malware with ESET's time-tested multilayered protection, trusted by over 110 million users worldwide. 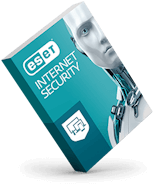 Provides proactive protection against all types of digital threats, including viruses, rootkits, worms and spyware. 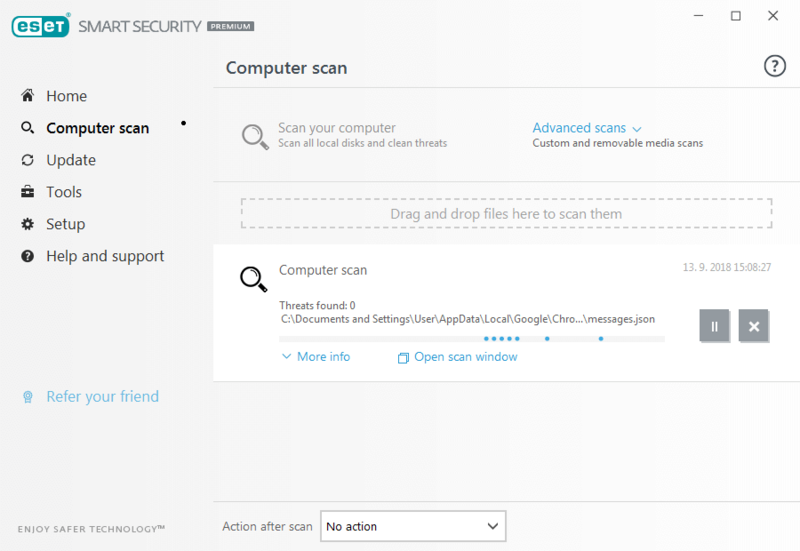 Automatically protects your computer from malicious network traffic, blocking threats revealed by dangerous traffic patterns. Alerts you when connecting to an unknown network and prompts you to switch to the Strict Protection mode. 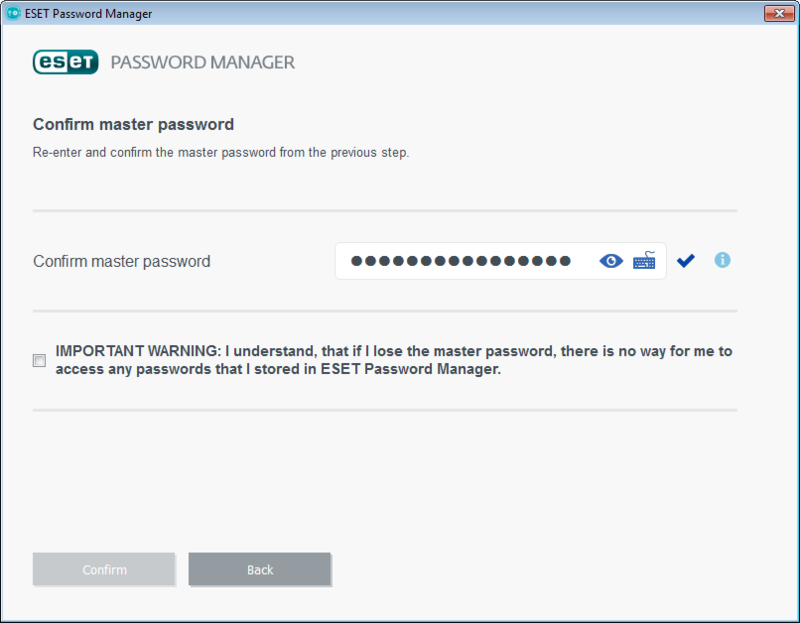 Makes your device invisible to other computers connected to the same network. Keeps unwanted emails from clogging your inbox. Whether you're working or playing, browse the internet without slowdowns.. Stay unplugged and online longer with battery-saving mode and enjoy gaming without distracting pop-ups. 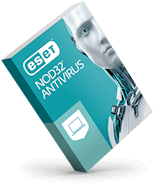 ESET automatically switches to silent mode when any program is run in full-screen. Postpones system updates and notifications to save resources for gaming, video, photos or presentations. 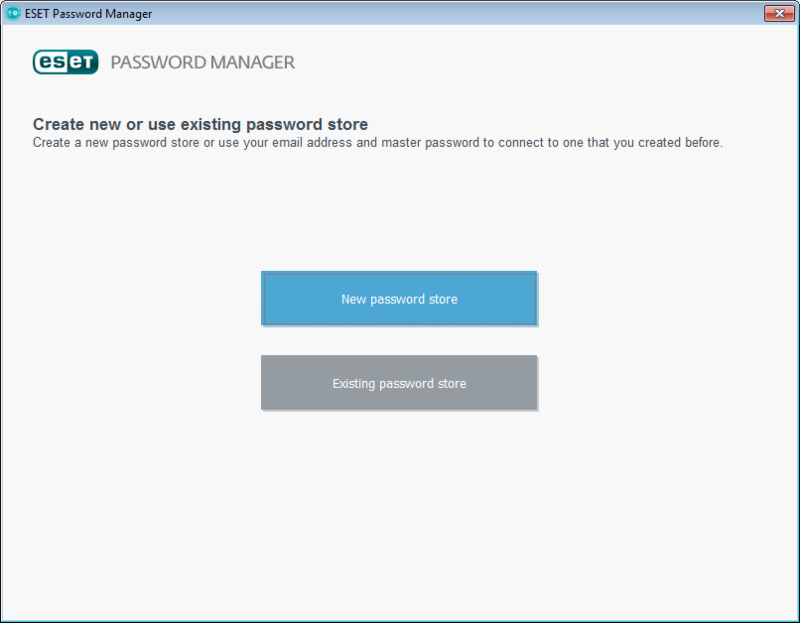 Easy to install, renew and upgrade, our security is also designed for the simple setup of all routine tasks. Or, fine-tune your profile with 150 detailed settings. New computer? Transfer your license anytime with ease. 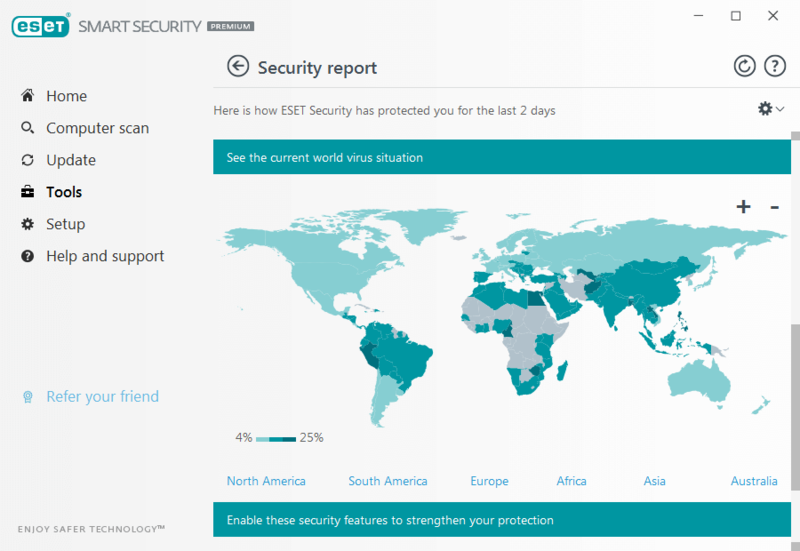 Lets you view your protection status and access the most frequently used tools from all screens. Offers comprehensive, one-click solutions to potential issues. 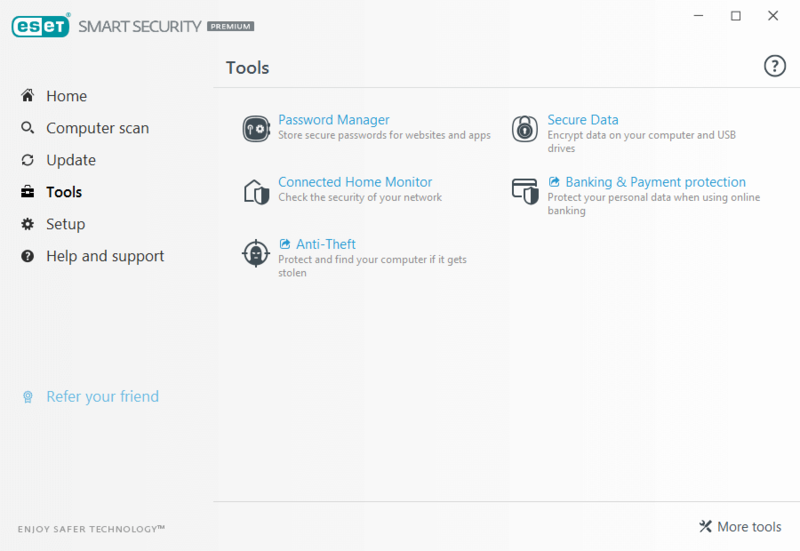 Offers in-depth security settings to fit your needs. Allows you to define maximum scanning depth, scanning time, size of the scanned files and archives, and much more. 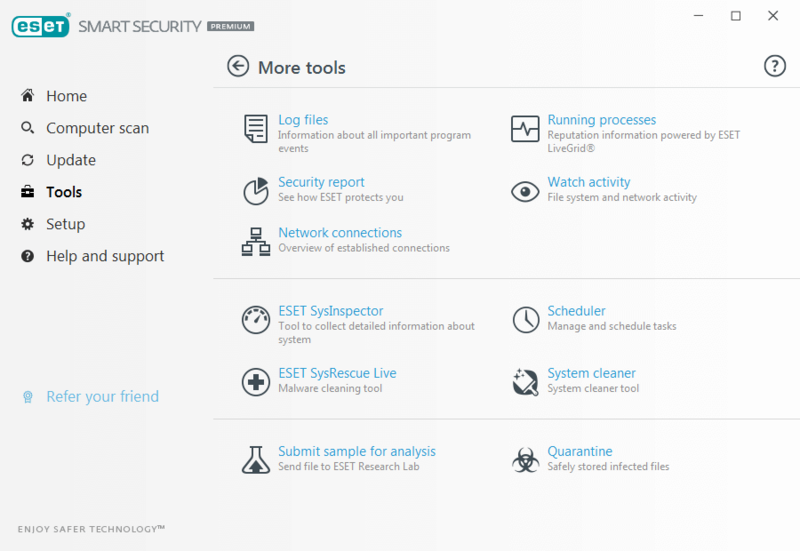 An advanced diagnostic tool that captures critical information from the system to troubleshoot a broad range of security and compatibility issues. 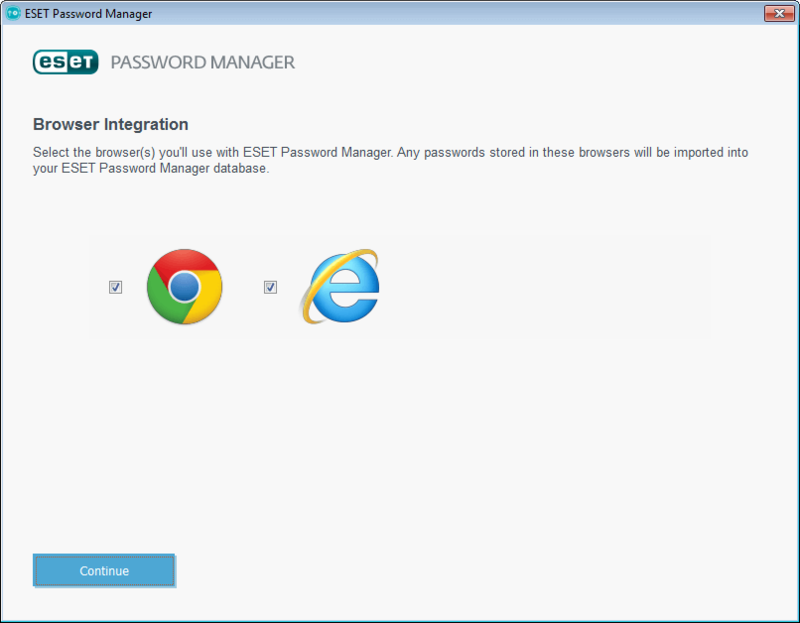 View, manage and associate your licenses and ESET installations straight from our easy-to-use my.eset.com portal. 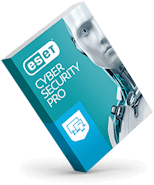 Your ESET license is flexible, so you can transfer it to a new computer or device any time you like. ESET Smart Security Premium runs on any system with Microsoft® Windows® 10, 8.1, 8, 7, Vista, and Microsoft Windows Home Server 2011. Internet connection required. Join these ESET customers today!